Your credit score, or FICO score, is a number that reflects your financial responsibility and helps lenders decide if you're a credit risk or not. 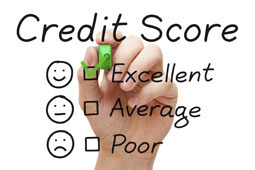 Your score is based on - but not part of - your credit report. It's generated at the time of request, then included with the report. Payment History - (approximately 35% of your score) The factor that has the biggest impact on your score is whether you've paid past credit accounts on time." Amounts Owed - (approximately 30%) Having credit accounts and owing money doesn't mean you're a high-risk borrower. But owing a lot of money on numerous accounts can suggest that you are financially overextended and more likely to make some payments late or not at all. Part of the science of scoring is determining how much debt is too much for a given credit profile. Length of Credit History - (approximately 15%) In general, a longer credit history will increase your FICO score. It shows that you can responsibly manage your available credit over time. New Credit - (approximately 10%) Opening several credit accounts in a short period of time can represent greater risk; especially for people with short credit histories. Requests for new credit can also represent greater risk. Types of Credit in Use - (approximately 10%) Your FICO score will reflect a combination of credit cards, retail accounts, installment loans, finance company accounts and mortgage loans. While a healthy mix will improve your score, it is not necessary to have one of each, and it is not a good idea to open credit accounts you don't intend to use. Your credit score lists up to four reasons why your score is not currently higher. These reasons can be very useful in helping you determine how you might improve your score over time, and whether your credit report might contain errors. If you already have a high score (for example, 740 or higher), some of the stated reasons for credit concerns may not be very helpful. They may reference the factors that have the least impact on your score, such as: length of credit history, new credit and types of credit in use.